BLIPMAPs give thermal soaring parameters over a geographic region. May 9: I have implemented "cookieless" access for registered users, though it does not have the full flexibility of cookie-enabled access. May 8: Updated the Contributors webpage. May 7: I added more information on how to deal with possible problems to the Registration Information webpage, although I have had remarkably few messages describing difficulties and so far 650 registered users have been able to successfully view forecasts. May 6: I implemented a module to let registered viewers who have forgotten their password or userID send that information to the email address supplied when registering. May 4: For those who tried to access or "Login" this AM and received an error, that problem has now been corrected. The long story is provided here. May 2: Updated the "Frequently Asked Questions" page (with answers). April 29: Updated BLIPMAP "to-do" projects list. Apr 21: THIS IS THE NEW WEBSITE ! If you are reading this then you are at the new website! I have constructed it to (hopefully) be identical to the previous one, but if you find something that does not seem to work properly please let me know as there are likely undiscovered bugs/deficiencies. Apr 2: I got some feedback on the April 1 BLIPMAPs! Apr 2: Updated the monthly BLIPMAP usage statistics. Mar 30 The clouds are fixed! I finally got things sorted out and am now running a corrected program with BLIPMAP cloud predictions turned back on. Bob Gibbons of Texas deserves thanks for having both the initiative to critically evaluate the "Cumulus Cloudbase" prediction and the knowledge to compare it to a simple surface-humidity LCL condensation formula. As a check, the "EXPERIMENTAL" parameter in the BLIPs will give the approximate formula prediction, which should be within 5% of the printed "Surface LCL" - after the validity of the latter has been demonstrated I will remove the EXPERIMENTAL parameter print. Those interested in additional details can read the "Sfc-humidity LCL: short and long stories" posting on the DrJack Forum. Mar 24: Contributors: I have added an option to send you, if interested, a daily email when the first BLIPMAP is produced for your region (this is primarily useful on those days when the "first of the day" BLIPMAP is delayed and you may want to "filter" it to a mailbox separate from your main mailbox). If you wish to be added to that list please let me know. Mar 22: BLIPMAP "help" page created: A "first source for new BLIPMAP users" and summary of additional information is available at the BLIPMAP Help webpage. Mar 21: Updated the Info on First Available Times. Mar 21: Parameter descriptions changed I have rewritten the parameter descriptions on this page and created a new linked page with "parameter details", with some diagrams, at the "MoreInfo" link of each parameter. Having a "parameter details" page provide a good basis for further growth since info can be added to it which would be too cumbersome to add to the basic parameter description. If you think anything can be improved upon or added to or leaves a question unanswered, please let me know and I will make changes. Mar 15: HAPPY BIRTHDAY TO BLIPMAP !!! March 16 is the first anniversary of the day on which the first nationwide BLIPMAP forecasts became available. When did you first hear about them?? Mar 13: More timely forecasts! Additional forecasts have just been implemented, so the BLIPMAPs you get will now have the the most timely information possible. Last summer, when the processing was being done on my old, slow machine, I was forced to provide only half the possible forecasts, i.e. even though FSL provides updated forecasts every 3 hours I was skipping every other one. Some users have noted that the forecasts sometimes change rapidly in the AM when conditions are uncertain. Also, some have to leave their houses (and their internet connection) hours in advance to drive to the gliderport. These additional forecasts will help such users, and all users, to have more timely forecasts than were previously possible. I should note that this is being done only after coordinating with Bill Hall, and he has agreed to this change which requires more processing on his machine. There is always the chance that this will later prove to be more of a burden than anticipated and have to be reversed - Bill is doing everyone a great service so this processing should not become bothersome to him. 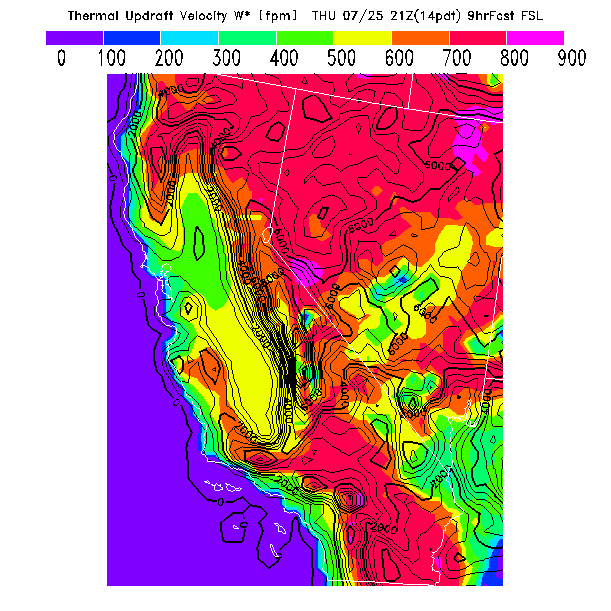 Mar 7: CA-NV Users: Daily "WINDIP" forecasts of upper-air winds and a simple mt. wave forecast are once again available at the WINDIP webpage. Feb 28: Updated pilot flight experiences using BLIPMAPs. Feb 28: Added a "Rainfall and Soil Moisture" note to the model prediction notes. Feb 13: I have created climatology plots from the 2002 forecasts, giving the monthly average of each parameter for each time of day (when available). In addition, I have computed statistics giving the average, standard deviation, minimum, and maximum for all parameters for all regions. These plots and statistics can be accessed via the BLIPmap 2002 Climatology webpage. Feb 5: In response to the many requests received on the first BLIPMAP User Survey, I have created a discussion group for thermal soaring forecasts and meteorology and I am asking that BLIPMAP users generally use that forum if they have a question or comment, since it likely is also of interest to someone else in the soaring community, rather than simply sending an email to me directly - although the latter is of course appropriate if there is some comment you wish to keep private. Feb 3: Updated the webpage giving information on creating new BLIP prediction locations nation-wide. Note that there must be a contribution to the BLIPMAP effort, of either money or time, to create a new BLIP for your location. Jan 28: Activated two new parameters intended to help forecast the presence and cloudbase of small puffy cumulus clouds that form in the BL. As indicated in their description, there is a theoretical difficulty with these parameters but I have had several reports that for some sites the method is nevertheless effective so decided to include them and let users evaluate how well these parameters work for their site. Jan 27: I'm glad I was able to meet many BLIPMAP users while at the SSA Convention in Dayton and at the Wright Aviation Museum and appreciate being presented with an SSA Exceptional Achievement Award there. I have placed on-line the slides presented in my talk at the 2003 SSA Convention. Jan 1, 2003: Congratulations to the first three awardees of the newly created "Order of the BLIPMAP Hero": Milt Hare (who flies his ASH-25 out of Williams, CA), Bill Hall (who flies with the Greater Boston Soaring Council), and John Whitney (who flies his ASW-20 at Blairstown, N.J.). As a testimonial to the time and effort they have voluntarily put into helping make BLIPMAP a product useful to pilots across the country, they have been presented with a "BLIPMAP HERO"[tm] award suitable for displaying on any T-shirt, sweat-shirt, or undergarment of their choice! These awards are not available for purchase in any store. Let's have a hearty round of applause for our "heroes"! 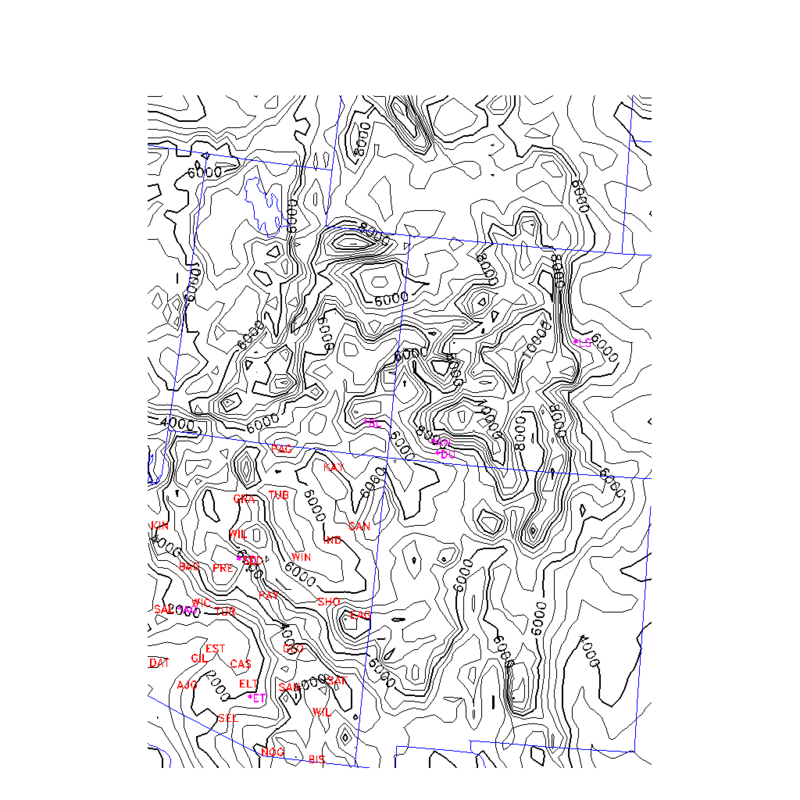 Dec 29: In response to user requests, to aid orientation with respect to the smoothed model topography I have modified my plotting program so placename IDs can be plotted on a BLIPMAP region. The first such plot has been created for AZ (SouthWest region) based on data provided by Gary Evans, so to see what one looks like you can view it here. There are currently (sparse) ID plots available for the CA-NV, NorthEast, SouthEast, OK-TX, NorthCentral, SouthCentral, and SouthWest regions: to view your region's ID plot or if you are interested in adding IDs for your region, see the regional orientation webpage. Sept 23: Who Uses BLIPMAPs? Of the 1,021 people who responded to a 3 week poll, 80% were Sailplane PIlots, 15% were HangGlider Pilots, 4% were ParaGlider Pilots, 0.6% were Weather Enthusiasts, 0.5% were Weather Workers, and 0.4% were None of the Above. Based on SSA and USHGA membership numbers, equally random voting from SailPlane/HangGlider/ParaGlider pilots would have given respective percentages of roughly 50/25/25 - the difference between those percentages and the actual results suggests to me that those who fly longer distances are more likely to use BLIPMAPs. Sept 2: Remarkable convergence prediction! Labor Day (today) was a remarkable day in the Sierras with many long flights. I was particularly interested in reports of a very long convergence line which moved eastward with time, since the BLIPMAPs predicted the occurrence of just such a convergence! Moreover, subsequence comparison to satellite photos confirms not only that BLIPMAP prediction but also it's prediction of a second (unflown) convergence line! I have created viewers to look at the hourly development and movement of both the convergence line forecasts and the satellite photos, with viewing instructions and a brief description, here. Aug 18: THE FUTURE ?? I have begun experimenting with BLIPMAPs using the NWS 12km ETA model instead of the FSL 20km RUC model. Advantages of the ETA are its higher resolution, 12km instead of 20km, and it provides extended forecasts out to 84 hours. Some results, for the "Current+2" and "Current+3" days only, can be viewed here [Note: the ETA regional areas differ from those of the RUC FSL model due to differing map projections used - if you find a different region is needed, go to the regional ETA webpage]. The program is still under development and these forecasts are not being updated daily, but these plots do illustrate what can be done. At present, the accuracy of ETA vis-a-vis RUC is not known and the accuracy of the longer-range forecasts is especially unknown. Whether such products might become regular predictions is uncertain, as each forecast requires downloading a half-gigabyte file and there is a cost associated with that. July 25: Added a link to an on-line version of the July 2002 SOARING magazine BLIPMAP article, which is a good "first thing to read" for potential BLIPMAP users. Processing remains stable. Forecast availability varies from day to day. I only look at the webpages and maps that I use personally or that I suspect might contain an error. If you notice a consistent problem with either, please let me know. If there is not yet a BLIPMAP produced for today and you want to see what BLIPMAPs look like, try clicking on the "PreviousDay" links below or see this sample BLIPMAP. Link to time series of traditional meteorological forecast variables, including cloud base, precipitation, surface wind, and CAPE. Only available for METAR locations. Users may find this page to be more useful than the FSL RUC forcast products webpage above, to determine the model-predicted cloud cover for example, since times are given as actual date/hour rather than as model forecast period. BLIPMAPs predict thermal soaring conditions resulting from surface heating of the Boundary Layer (BL), the scientific term for the turbulent atmospheric region mixed by surface-based thermals (so thermal tops occur at the top of the BL). The BLIPMAP program post-processes numerical weather model predictions to provide parameters suited to the needs of soaring pilots. Relative differences, both in location and in time, are expected to be more reliable indicators of soaring differences than are the precise numerical values. A sequence of forecasts, all for the same validation time, is produced during the night. The most important link is the first link on each line, "Latest", which gives the most recent (shortest term) forecast. The following "FirstToday" link gives the first forecast from the current day, which can be used to determine whether the model is significantly altering its predictions during the updating. The last link, "PreviousDay", gives the last forecast from the previous day's prediction sequence, useful for those who want to compare their experiences from yesterday's flight to the BLIPMAP predictions. The parameter values are represented by color hues which increase in "warmness" as the value increases in magnitude. When many gradations are required, two cycles are made through the color wheel with "light" and "intense" tints respectively representing ranges of lower and higher magnitude. A screen magnifying tool, such as the freeware Super Magnify for Windows machines or Xzoom for X11/Linux/Unix machines, helps when discrimination between adjacent contours is difficult. State outlines are depicted on each BLIPMAP in white. The RUC topography is plotted as black contours, at 500 ft intervals with thicker lines at 2000 ft intervals, to assist in location identification but also to emphasize the smoothed nature of the model topography. The BLIPMAP does not predict thermal lift created by small-scale terrain features which are not resolved by the model topography, which often give localized updrafts significantly stronger than those over the surrounding smoother terrain. The BLIPMAP is still in development and there will likely be problems, changes, and tweaks. Opinions on factors affecting its usability are solicited. Heros: We all thank FSL's Stan Benjamin for providing access to the 20km FSL RUC results. A special BLIPMAP hero is Bill Hall of the Greater Boston Soaring Council who is presently hosting the BLIPMAP processing on his machine. I also want to personally thank those whose support is listed on the Contributors webpage.